Sweet potatoes are called in various names. Batata, boniato, and camote in Spain and Mexico; kumar in Peru; kumara in the Polynesian Islands, including New Zealand; cilera abana (protector of the children) in Eastern Africa; ubhatata in South Africa; and kara-imo and satsuma-imo in Japan. In China alone, sweet potatoes are called different names in different parts of China. Sweet potatoes are supposed to be native to Central America, but as far as I know, the Chinese have been eating sweet potatoes a very long time ago. 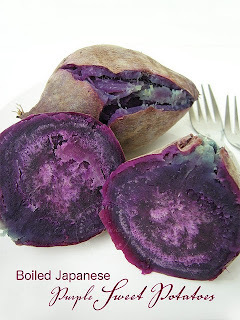 In China and Japan, baked and steamed sweet potatoes are popularly sold as street food. In fact China is now the largest grower of sweet potatoes and accounts for 80% of the world’s supply. China grows over 100 varieties of sweet potatoes. Sweet potatoes contain high levels of antioxidant nutrients, anti-inflammatory nutrients, and blood sugar-regulating nutrients. They are packed with vitamins A (in the form of beta-carotene) , B6 (pyridoxine), and C. They have plenty of manganese, copper, potassium, iron and dietary fiber, together with complex carbohydrates. 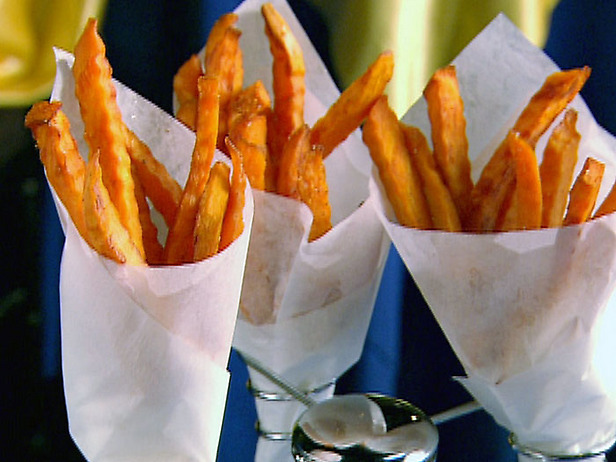 But sweet potatoes are low in calories and fat-free. 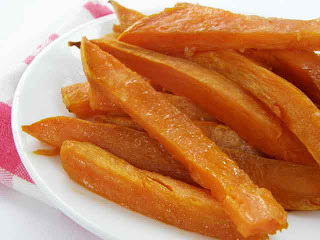 The orange-fleshed sweet potatoes are very rich in beta-carotene which gives us vitamin A. Sweet potatoes have been used to help children in Africa to improve their vitamin A deficiency. No wonder it’s called “protector of the children” in Africa. Despite its name, sweet potatoes help to stabilize blood sugar levels and to lower insulin resistance. 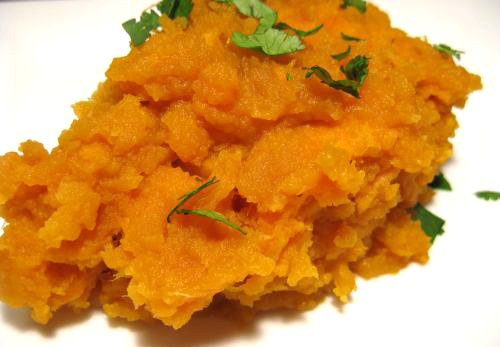 Diabetics should eat more sweet potatoes. Sweet potatoes are not always orange-fleshed on the inside but can also be a spectacular purple color. 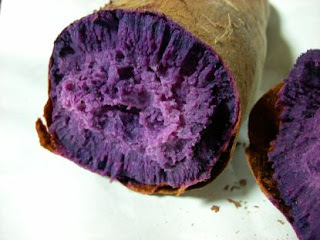 Sometimes it's impossible to tell from the skin of sweet potato just how rich in purple tones its inside will be. 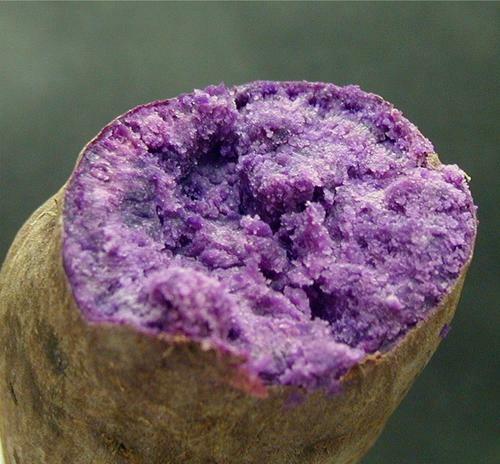 That's because scientists have now identified the exact genes in sweet potatoes (IbMYB1 and IbMYB2) that get activated to produce the purple anthocyanin pigments responsible for the rich purple tones of the flesh. 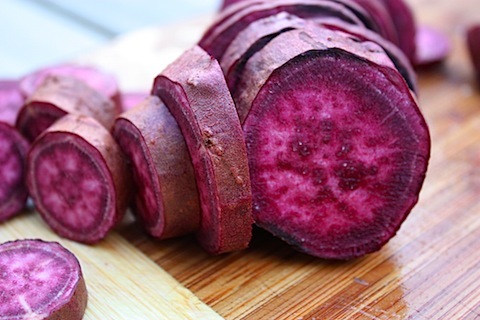 The purple-fleshed sweet potato anthocyanins-primarily peonidins and cyanidins-have important antioxidant properties and anti-inflammatory properties. Particularly when passing through our digestive tract, they may be able to lower the potential health risk posed by heavy metals and oxygen radicals. 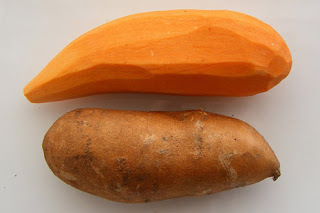 Yet beta-carotene only begins to tell the story of sweet potato antioxidants. Particularly in purple-fleshed sweet potato, antioxidant anthocyanin pigments are abundant. Cyanidins and peonidins are concentrated in the starchy core of part of purple-fleshed sweet potatoes, and these antioxidant nutrients may be even more concentrated in the flesh than in the skin. 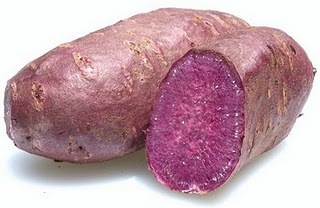 That's sweet potatoes have genes (IbMYB1 and IbMYB2) that are specialized for the production of anthocyanin pigments in the fleshy part of the tuber. Ordinary, we have to rely on the skins of foods for this same level of anthocyanin antioxidants. But not in the case of sweet potatoes! Extracts from the highly pigmented and colorful purple-fleshed and purple-skinned sweet potatoes have been shown in research studies to increased the activity of two key antioxidant enzymes-copper/zinc superoxide dismutase (Cu/Zn-SOD) and catalase (CAT). Recent research has shown that particularly when passing through our digestive tract, sweet potato cyanidins and peonidins and other color-related phytonutrients may be able to lower the potential health risk posed by heavy metals and oxygen radicals. That risk reduction is important not only for individuals at risk of digestive tract problems like irritable bowel syndrome or ulcerative colitis but for all persons wanting to reduce the potential risk posed by heavy metal residues (like mercury or cadmium or arsenic) in their diet. 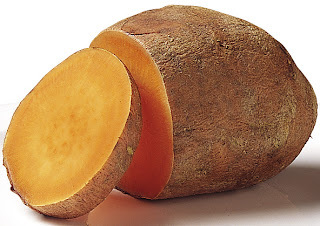 Storage proteins in sweet potato also have important antioxidant properties. These storage proteins-called sporamins-get produced by sweet potato plants whenever the plants are subjected to physical damage. 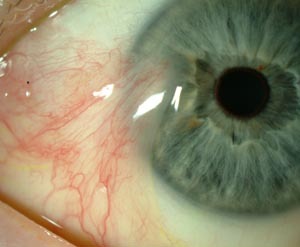 Their ability to help the plants heal from this damage is significantly related to their role as antioxidants. Especially when sweet potato is being digested inside of our gastrointestinal tract, we may get some of these same antioxidant benefits. Anthocyanin and other color-related pigments in sweet potato are equally valuable for their anti-inflammatory health benefits. In the case of inflammation, scientists understand even more about the amazing properties of this tuber. In animal studies, activation of nuclear factor-kappa B (NF-κB); activation of inducible nitric oxide synthase (iNOS), and cyclooxygenase-2 (COX-2); and formation of malondialdehyde (MDA) have all be shown to get reduced following consumption of either sweet potato or its color-containing extracts. Since each of these events can play a key role in the development of unwanted inflammation, their reduction by sweet potato phytonutrients marks a clear role for this food in inflammation-related health problems. In animal studies, reduced inflammation following sweet potato consumption has been shown in brain tissue and nerve tissue throughout the body. Many people think about starchy root vegetables as a food group that could not possibly be helpful for controlling their blood sugar. That's because many people realize that food starches can be converted by our digestive tract into simple sugars. If foods are especially concentrated in starch, there can often be a risk of too much simple sugar release in our digestive tract and too much pressure upon our bloodstream to uptake more sugar. (The result in this situation would be an overly quick elevation of our blood sugar level.) What's fascinating about sweet potatoes is their ability to actually improve blood sugar regulation-even in persons with type 2 diabetes. While sweet potatoes do contain a valuable amount of dietary fiber (just over 3 grams per medium sweet potato) and if boiled or steamed can carry a very reasonable glycemic index (GI) rating of approximately 50, it may not be either of these factors that explains their unusual blood sugar regulating benefits. Recent research has shown that extracts from sweet potatoes can significantly increase blood levels of adiponectin in persons with type 2 diabetes. Adiponectin is a protein hormone produced by our fat cells, and it serves as an important modifier of insulin metabolism. Persons with poorly-regulated insulin metabolism and insulin insensitivity tend to have lower levels of adiponectin, and persons with healthier insulin metabolism tend to have higher levels. While more research on much larger groups of individuals to further evaluate and confirm these blood sugar regulating benefits, this area of health research is an especially exciting one for anyone who loves sweet potatoes. Take note of the purple-fleshed sweet potatoes. 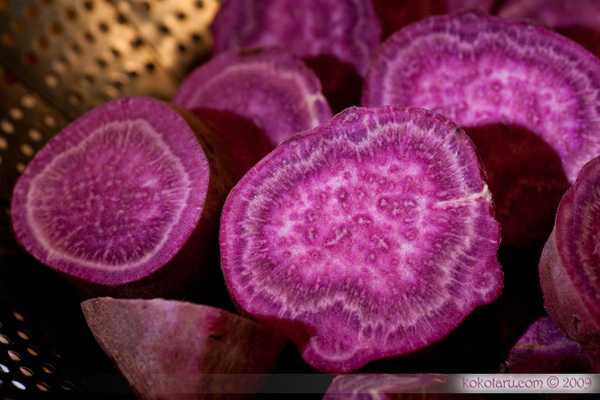 These purple sweet potatoes are purple in color due to the presence of a powerful antioxidant called anthocyanin. Antioxidants are present in fruits and vegetables, and they help prevent diseases relating to cardiovascular problems and cancer. They also strengthen the immune system, are anti-inflammatory, and keep bones and skin healthy. The most powerful antioxidants are called phytochemicals, and the two very potent of these chemical compounds are beta-carotene and anthocyanin. 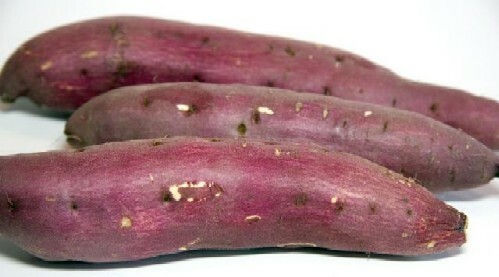 Anthocyanins are flavenoid compounds which produce the purplish pigmentation in the purple sweet potatoes. Two strands of anthocyanin, called cyanidin and peonidin, are powerful antioxidants which slow down the growth of cancerous cells, and are used to treat colon cancer. Research has shown that cyanidins and peonidins when passing through the digestive tract, may be able to reduce damage caused by heavy metals and oxygen radicals. Sweet potatoes have storage proteins called sporamins which help the potatoes to heal its damaged parts. These are also antioxidants which are beneficial to our gastrointestinal tract. Another lesser known nutrient group of the sweet potatoes are the resin glycosides, which have antibacterial and antifungal properties. How to eat sweet potatoes ? Store sweet potatoes in a cool dry place. Do not keep them in the refrigerator as the taste will be affected. Do not wash them when storing as the moisture will hasten their decay. As the sweet potatoes mature, an enzyme converts most of its starches into sugars. This sweetness continues to increase during storage and when they are cooked. 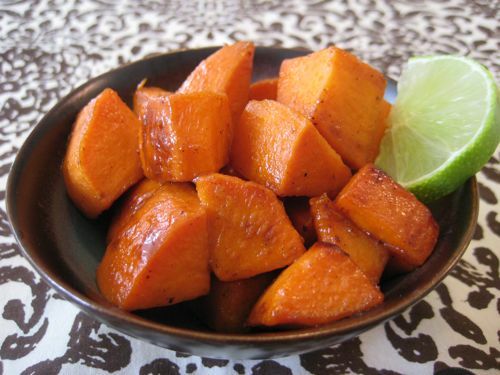 The best healthy method to eat sweet potatoes is by steaming them whole with the skin intact. They should be ready for consumption within 7 minutes of steaming. 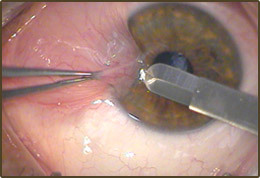 As the skin also contains rich nutrients, you can also eat it with the flesh. If you don't want to eat the skin, it can be easily peeled off after the sweet potatoes are cooked. By the way, the leaves of the sweet potatoes are also edible. They are nutritious and delicious. We usually stir fry them with dried prawns and chillies. 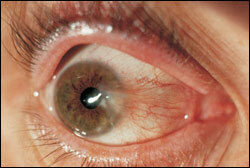 About 80% of kidney stones formed by adults in the U.S. are calcium oxalate stones. Sweet potatoes are amongst a small group of foods that contain a reasonable amount of oxalates; and for this reason, those with kidney or gallbladder problems may want to avoid eating too much sweet potatoes. The orange-flesh sweet potatoes are exceedingly rich in beta-carotene. 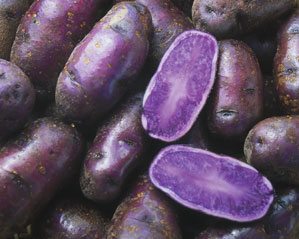 The purple-flesh varieties are outstanding sources of anthocyanins, especially peonidins and cyanidins. Both types of sweet potatoes are rich in unique phytonutrients, including polysaccharide-related molecules called batatins and batatosides. Sweet potatoes also include storage proteins called sporamins that have unique antioxidant properties. Sweet potatoes are an excellent source of vitamin A (in the form of beta-carotene). 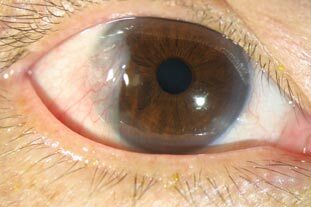 They are also a very good source of vitamin C and manganese. In addition, sweet potatoes are a good source of copper, dietary fiber, vitamin B6, potassium and iron.